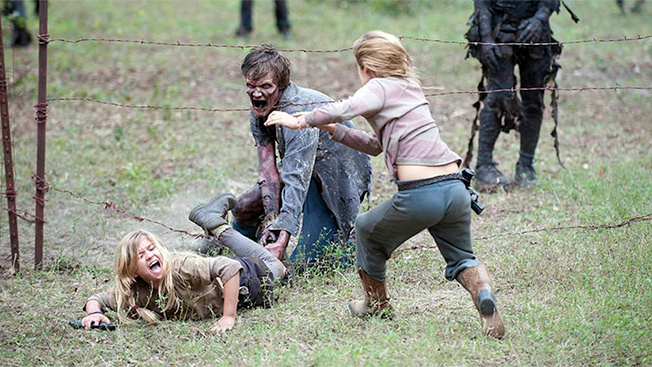 The Walking Dead is staggering its way toward a date with broadcast TV. Beginning this fall, the AMC zombie apocalypse thriller will begin airing on MyNetworkTV, making the 21st Century Fox asset the exclusive broadcast home to television’s highest-rated show. MyNetwork TV will stack two repeats of The Walking Dead on a yet-to-be-determined weeknight. Given the show’s reliance on nightmarish violence—the ambulatory corpses that regularly feed on the surviving human population are big on tearing into viscera and can only be destroyed by catastrophic brain trauma—the episodes will require a good deal of editing if MyTV is to comply with Federal Communications Commission regulations. Sources with knowledge of the deal said that the repurposed episodes will be rated TV-14. For the sake of context, some broadcast shows that carry the TV-14 rating include NBC’s Revolution and The Blacklist, the CW’s Supernatural, Fox’s Sleepy Hollow and CBS’ Criminal Minds. The Walking Dead joins a stable of MyTV off-net programming that includes Law & Order: Criminal Intent, House, Bones and Monk. Launched in 2006, MyTV is distributed in 186 of the country’s 210 DMAs and reaches 97 percent of all TV homes.